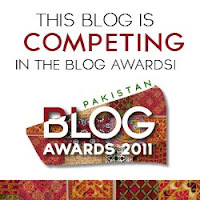 Lahore School of Economics blog has been nominated in annual Pakistan Blog Award 2011. Voting is on! 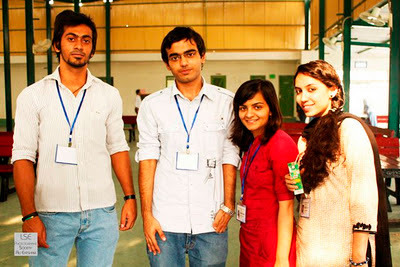 Readers of Lahore School Blog to please vote here. You can rate the blog (golden little stars for rating and voting are under the top line). Better still, please comment and show your support for the leading education blog in Pakistan that is also one of the oldest in the country. It started in 2004 when the word blog was less known. 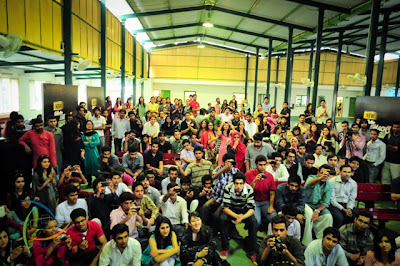 It is Colors of Pakistan : Celebrating The New Media Spaces continuously ever since and has been a source of motivation for many young scholars of the Lahore School to start their own blogs. The voting is open throughout till December 5, 2011. Vote here. Comment here. Learn how to vote here. 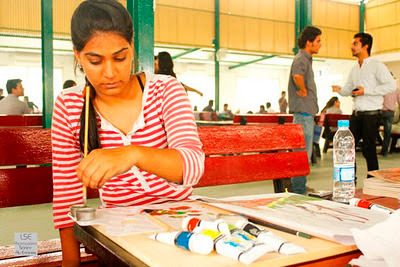 The Lahore School Arts Society mural painting sessions are held in the Garden Café regularly on Wednesdays and Fridays. 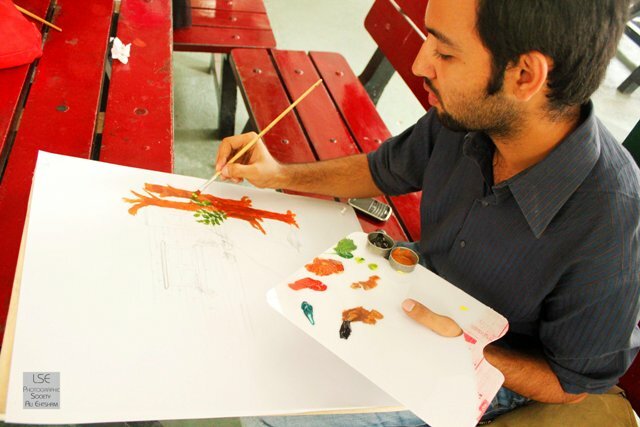 Based on the venue of the activity, the theme of these sessions this semester is ‘Let us make a garden.’ Students discuss their ideas with Shahid Mirza after which they start painting on canvases. The thematic murals will show case student artists’ expression of beauty, peace and tranquility. The Lahore School Society of Literature organized its First Inter-Institution Short Story Writing Competition 2011 which was divided in two sessions: the first session, the competition itself, took place on Nov 16, 2011 at the SBS library. 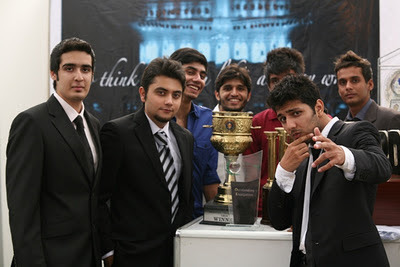 Twenty-one participants from eight different institutions from Lahore took part in the competition. 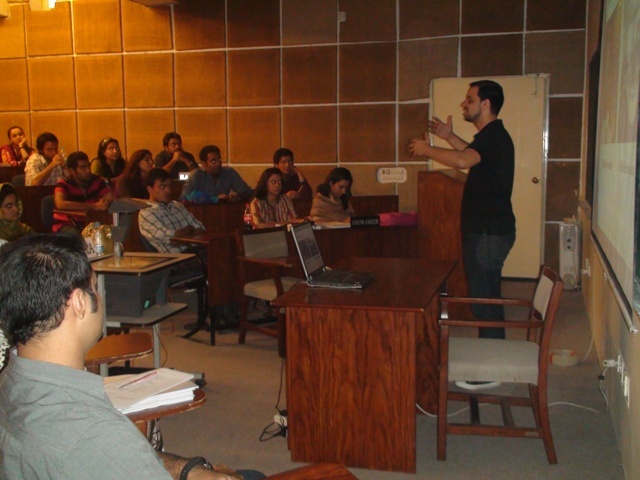 The participants were shown a set of three issues (Labor, Patriotism, women) based photographs. 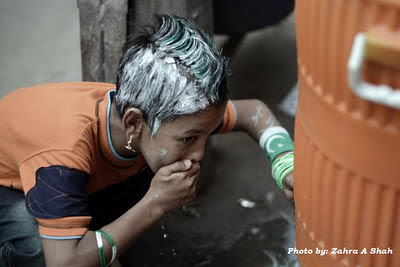 Each student could choose any one of the photos to draw inspiration from and write a short story of 1000-1200 words. The entries have been sent to a panel of external judges for deliberation [Ali Rizvi (Pakistan Today), Bilal Tanveer (LUMS) and Miranda Hussain (Newsweek)]. 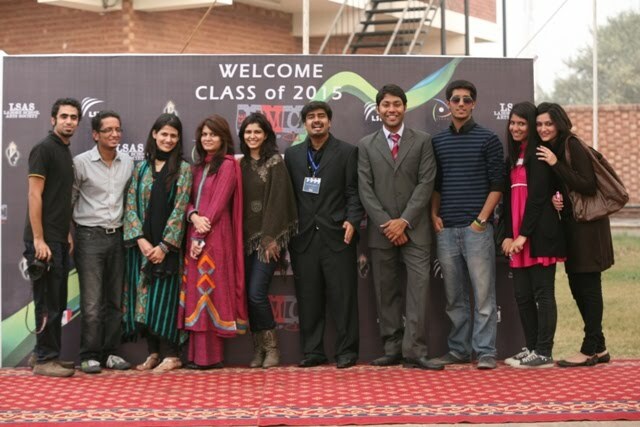 Lahore School of Economics welcomes Class of 2015. Grand welcome party was held in lush green Shumaila Garden decorated with beautiful stalls by different societies in the Main Campus on November 24, 2011. Dr. Shahid Amjad Chaudhry, the Rector Lahore School of Economics welcomed the fresh students and gave an overview of the achievements of the School. The Lahore School of Economics - a distinguished seat of learning known for high quality teaching and research. 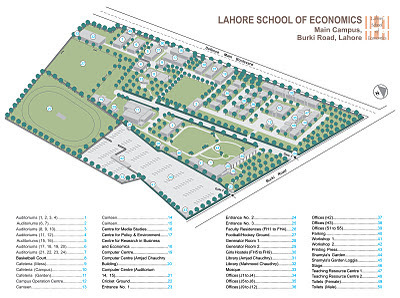 The Lahore School of Economics or “The Lahore School” was established in 1993 and chartered by the Government of Punjab in January 1997, through the Lahore School of Economics Act 1997 (Provincial Assembly of the Punjab- Act II of 1997). 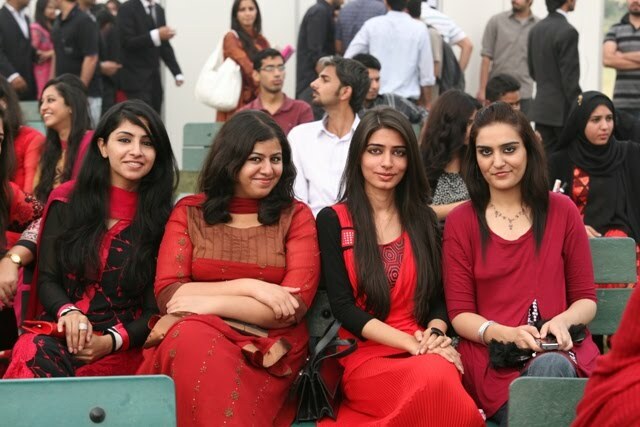 Most of the extra circular and co-academic activities in the School are conducted by the students themselves through different societies – Arts Society, Debating Society, Film and Media Club, Literature Society, Photography Society, Social Awareness Society, Sports Society and Welfare Society. All these societies were introduced to incoming class of 2015 who were dressed in black (boys) and red (girls) attires. 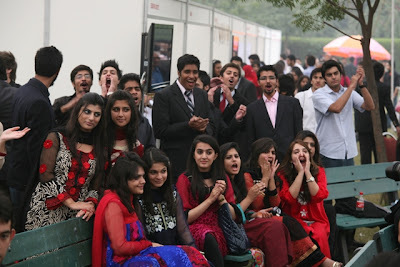 Creative and very amusing announcements by Chishti and Aleeshay Khar and various performances by students of Lahore School also amused the audience that also included a large number of Alumni. 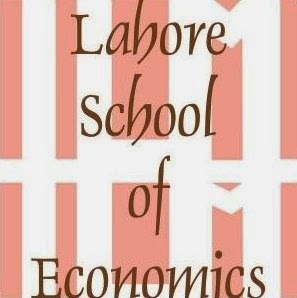 For new students, joining the Lahore School of Economics signals the moment of their initiation as students in an awesome environment. 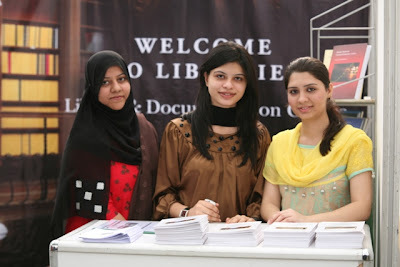 The Lahore School is a university that is proud of its students, faculty, green walkways, courtyards (and peacocks), libraries and computer laboratories. 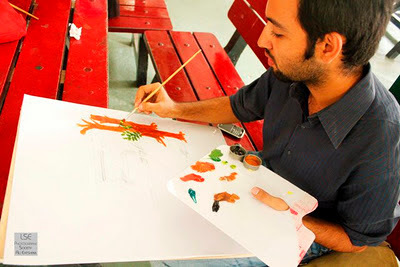 Creative and academic milieu in the Lahore School guarantees success - though certainly in part attributable to their hard work and intelligence. In fact, the Lahore School brings together inspired people who, together and individually, do remarkable things. 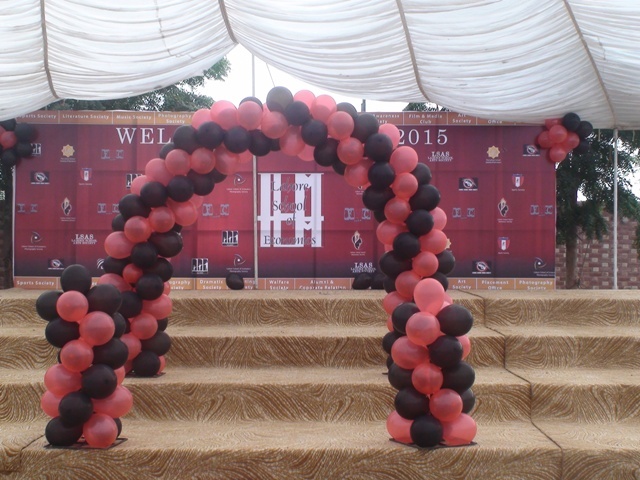 The School knows that students will embrace the good of this place. Starting right now, this place is yours. You are welcome! JSTOR (Journal STORage) is a subscription service that maintains an electronic archive of important scholarly journals and provides access to these journals to its subscribers. JSTOR offers researchers the ability to retrieve issues of journals as they were originally designed, printed, and illustrated. Content in JSTOR spans many disciplines from Business to Economy to Finance to Mathematics and much more. 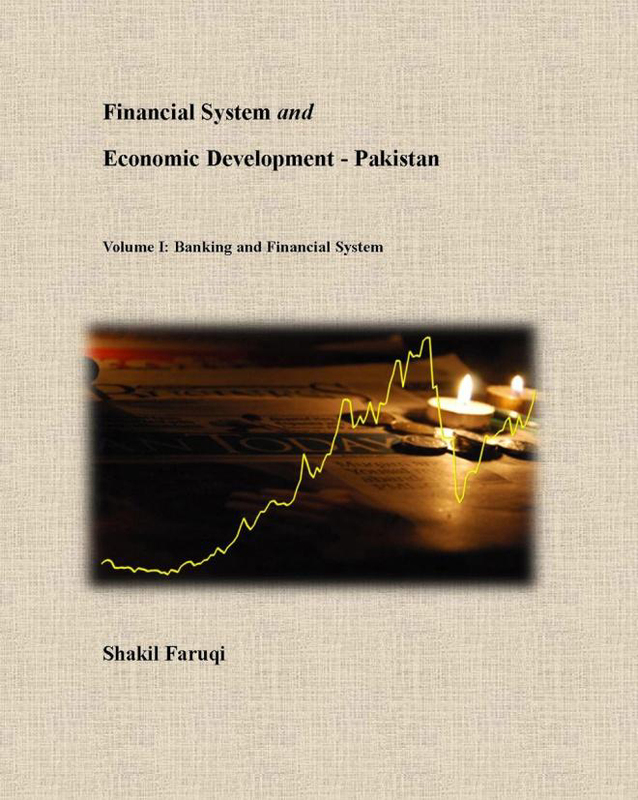 This applied study in two volumes has been published for graduate level studies in banking, financial system and financial markets at academic institutions though it may also be helpful to professionals engaged in banking and financial markets in Pakistan. The primary objective of this text book is to enhance learning of what a financial system is, how it operates, and how these operations impact on the economy, and how this performance in Pakistan compares with performance in other countries. In parallel, how operations of financial system affects well being of various segments of society, though social dimensions of impact are not a part of analytical framework of financial system. 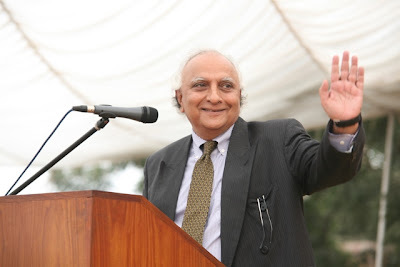 Lahore Journal of Business (LJB), a peer reviewed biannual publication of the Lahore School of Economics, is aimed at providing a specialized forum for dissemination of qualitative and quantitative research in various areas of business administration. LJB invites researchers, policy makers and analysts to submit competitive theoretical and empirical papers for its first issue that explore and contribute to the understanding of various areas in business domain. The Journal aims at bringing together state of art research findings in various business disciplines including (but not limited to) accounting, banking, management, marketing, finance, investments, human resource management and organizational behavior. The submission of articles will be followed by an editorial review to determine the relevance of manuscript and scope of the Journal. On editorial acceptance, there will be a double-blind review by our advisory panel that comprise of eminent international and local researchers and scholars. The recommendations/comments of the referees will be communicated to the corresponding authors. 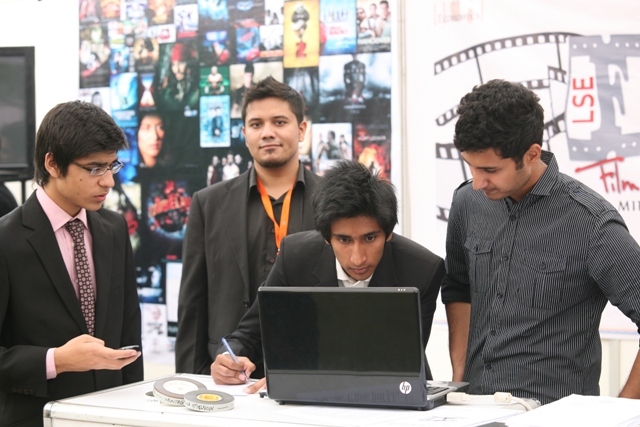 The papers are now being considered for the first issue. 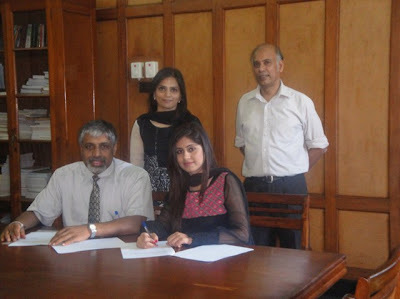 The manuscript can be submitted in electronic format (.doc and .docx only) here. 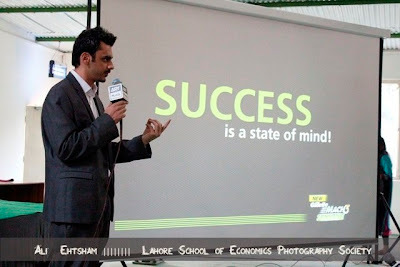 The interactive session was attended by large number of Lahore School students.